Nothing says, “I’m sweet on you!” like a box of old-fashioned candy. In days past we scribbled our name on generic Valentine cards to pass out to our classmates. Occasionally, there would be a special one that landed in our heart-shaped envelope we’d made out of construction paper. Now that we’re older, we look for other ways to show our adoration for our spouses, significant others and special friends. If you’re looking for more than flowers and a traditional box of chocolates, check out these Valentine’s Day gift ideas that are retro-inspired and sure to please. Nostalgic Candy – Yummy memories and unique flavors make this an all-time classic treat for loved ones. Kids love it, too, so it’s a great way to introduce them to the sweets you ate as a kid. 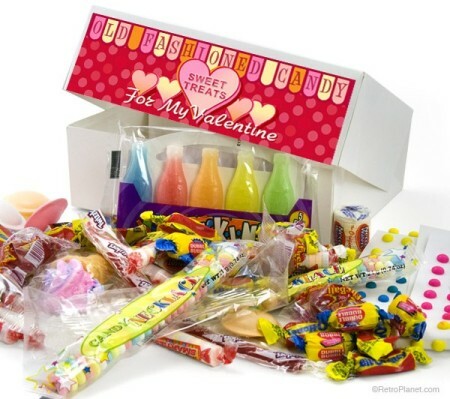 You can opt to send a Valentine box of candy, or select several kinds to build your own basket. Betty Boop Collectibles – A true classic, just about everyone loves Betty Boop, and there are lots of unique gifts – from a leg kick bathrobe to a retro coffee mug. 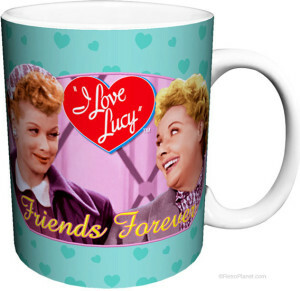 I Love Lucy Collectibles – Your best girlfriend will appreciate the sentiment and the humor of a Lucy and Ethel coffee mug, tin sign and more. For a more stated gift, choose one of the “Friends Forever” items. Harley-Davidson Decor – If he or she loves to ride, classic Harley home decor or collectibles make a perfect gift. From bar sets to furniture and clocks, there’s something to fit every budget. Be sure to check out the window decals and auto tags. “Kissing” Salt & Pepper Shakers – They’re adorable and functional, and are available in many different themes. Magnets keep them locking lips! Whether these retro salt & pepper shakers are put to use or simply displayed, she’ll cherish these for years to come. Retro Telephones – From the classic princess phone (in pink!) to a functioning pay phone, these replica phones are available in his or her favorite colors – black, chrome, pink and red. Best part? They cost less than $100 each. Anniversary Edition Rose Kit-Cat Clock – It’s the perfect gift for mom or wife. This red Kit-Cat clock has the same features as the traditional black one, but comes in that Valentine color she’ll adore. Coffee Mugs – From the classic diner mug to novelty coffee cups, they’ll appreciate the vintage appeal. Decor for His Man Cave – Guys are simple. They want their space and they want full control over its decor. You’ll find plenty of tin signs, clocks and furniture of his choice right here. When searching for that unique gift, consider his or her passions and hobbies. Valentine’s Day is, for many, a holiday that doesn’t necessarily dictate a particular type of gift, so long as it is thoughtful and shows that you care. Keep that in mind and you’re sure to find that special something that suits his or her taste and your budget.